Do you see how I got super elegant all of a sudden? I needed to bring myself down from this goofy, stand mixer, halloween induced high. So I went with the fancy recipe today. Any recipe with the word "tartelette" in it sounds fancy...well, unless you're British. Then you'd have quite a laugh at the word "tartelette" wouldn't you? Well today I'm not talking about "tramps in training," I'm talking pumpkin chipotle! This sounds like the perfect appetizer to take to a Thanksgiving party where maybe you are trying to impress some in laws? I dunno, I don't have in-laws but they would be very impressive nonetheless. 1. Deseed the pumpkin and cut into cubes. About half the size of your thumb. 2. Place on a greased baking tray and drizzle with the maple syrup. Toss with your hands to evenly coat the pumpkin and bake in at 350 for about 40 minutes until soft. 3. Puree the baked pumpkin in a large bowl with a hand blender. Add the butter, brown sugar, chipotle, cinnamon and salt. Mix well. 4. Meanwhile butter the tartelette tray or mini muffin pan and line them with the pie crust circles. Once the pumpkin puree has cooled, add the two eggs and buttermilk and mix well. 5. Fill the pasty cups with pumpkin chipotle puree and slide into the 350f oven for about 40 minutes. Watch them carefully. 6. Pinkies up and Enjoy! 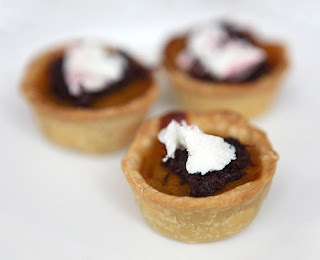 Note: The recipe calls for beet jam and chevre. Those recipes are on the Louis Comfort Tiffany website. I'm not touchin' beet jam. No thank you.